It’s finally here, our first week of the Love Dare Challenge for parents. If you missed the info. on how to follow along go here. You can jump in at any point of our journey and remember your kids don’t have to be little or even at home to join us! It’s FREE! Here’s the book if you want to purchase for yourself. This week we’ll be covering these two challenges: Love Blooms and Love is Patient. You can take it at your own pace but I think doing two dares a week is a good start. On Thursdays of every week, I’ll start the second love dare with my family. I’ll share on Facebook a reminder for the second love dare and other inspiring quotes throughout the week. And of course you’ll have this article here to come back to if you’re needing more inspiration. Make sure to share in the comments your experience and also your thoughts about the dares. What stood out to your from what the author shared. This will help us all learn from each other as something may stand out to you that I may have missed in my reading. So, let’s get started with #reclaimingfamily! First, before we begin there’s a free parenting assessment you can take. Just go here to see you’re parenting strengths and areas you need more work on, you might be surprised by the results. I recently had a friend share that while out shopping her son had a meltdown because she wouldn’t buy him the toy he wanted. A woman walked past her and actually had the audacity to say out loud, “What a terrible mom.” as she passed by my friend. Even though her words had no validity it was very hurtful to hear as a mother. I think more often then not we are confused by what love actually looks like. Our society, peer pressure and people like the woman above tend to cloud our perspective. For my friend, love at that moment meant saying “no”to her son, but society and even peers tell us it’s okay to raise entitled children. Maybe for you, love means saying “yes” a bit more often. Yes, I can play ball with you for 15 minutes. Yes, I can read a book with you before you take a nap. Yes, I can stop what I’m doing to attentively listen to what you have to say (even if makes no sense to me). Let’s dive into the vastness and richness love sows in our family. These two short words are powerful and packed with so much meaning! Let it marinate in your mind. What values are you planting not just in theory but with your actions? 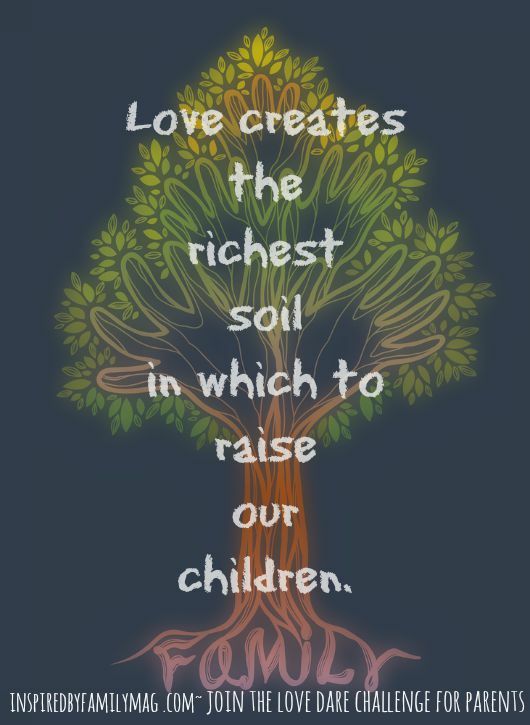 Your kids should not only be the fruit of your love, but should also be deeply rooted in the nurture of your love…on a daily basis. Love our children–is a no brainer. As good parents we all strive to love them, but our best intentions sometimes get overshadowed by the our bad parenting habits or busyness, and demands of the daily grind. Other times our priorities get all mixed up because we are trying to keep up with our neighbors, friends, co-workers that we forget about what really matters. Is love spoken not just seen in your home? We hurt our children, when we don’t forgive them. Make a commitment today to give it your all to remove those obstacles and establish a strong foundation of love for your children to bloom within. Think back to your own childhood (not too much though) and ask yourself were these questions answered by my parents. Do I matter? Does anyone truly care about me? Do I have what it takes? If not, resolve to stop that cycle and start a new pattern for your kids. If you did, you are blessed! Make sure that you leave this legacy behind. The bottom line is kids and even adults come with these core questions hidden in their hearts. Truth guides what you say while love guides how, why, and when you say it. If you have tween or older child ask yourself this: Do the truths I share take root? Or are they ignored? If so, ask yourself why. Are you sharing these truths, values, beliefs, faith–in love? We must start by laying love as the fertile soil, and then you can plant your seeds of truth. Now it’s your turn! Okay now that you’ve read Day 1 here’s your assignment. Tell us on Facebook or in the comments below, when you’ve completed today’s dare! How to Live From a Place of Love--Live Loved!